While looking for brainfuck related things, I came across Simon Forsberg's FizzBuzz in Brainfuck and cheekily commented a link to my own brainfuck FizzBuzz answer over on PPCG. He suggested I should post my own Code Review question with a detailed explanation. Checking the number: Checks if the number is divisible by 3 or 5, and printing Fizz and/or Buzz if so. 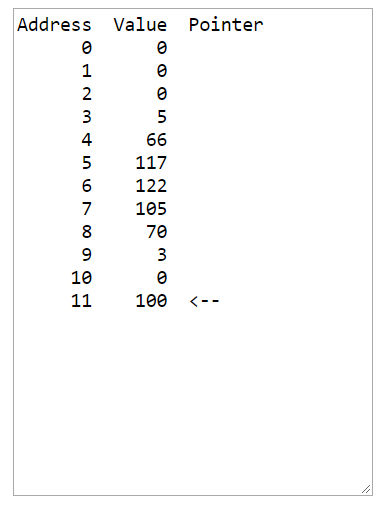 Cell 4 through 8: These are the ascii values for "BuziF", a compact way of representing both "Fizz" and "Buzz". Both the Fizz and Buzz counters are initially set to 5 and 3 respectively. At each iteration of the loop, both counters are decremented. If either reach 0, their respective string is printed and resets the counter. It also sets a check for later to not print the number. Here's a python representation of this section of the code. If the FizzBuzz check is empty, we need to print the number as an actual string. Since brainfuck doesn't have a way to convert a cell value to a printed number (surprise surprise), we need to convert the counter to two ASCII values (not three, since 100 is "Buzz") representing the number. The tape setup, which can probably be shorter. Should I setup the newline cell (10) in the tape generation section rather than generate it once per loop? By just going through it in such detail in this question I've already thought of several ways to shorten the code, so there's that at least. Browse other questions tagged fizzbuzz brainfuck or ask your own question.